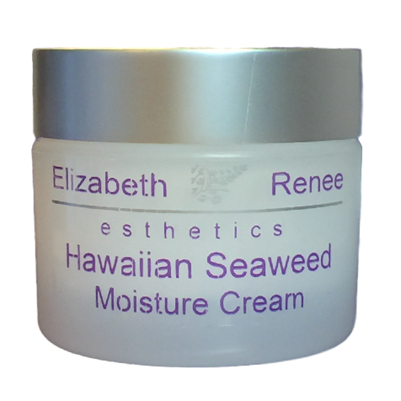 Hawaiian Seaweed Moisture Cream by Elizabeth Renee Esthetics heals dry, sensitive skin by using an extract produced via bio-fermentation of a select strain of red marine algae, which is found abundantly along the shores of the Hawaiian Islands. This new technology intensifies the effects of rich sea minerals and enzymes that are beneficial to your skin as it helps soften surface lines, decrease sensitivity, and reveal a smooth radiance. Because of its healing properties, this repairing moisturizer is ideal for those with rosacea, acne, excema and extremely sensitive skin. Clinical studies have shown a substantial increase in collagen stimulation and a 20-percent increase in firmness within four weeks. Many compare the results to Créme de La Mer, but our formula does not contain mineral oil, petroleum, parabens, dyes or artificial fragrance and is lightweight on the skin so it won't clog the pores. This creamy, rich moisturizer is white in color, has the scent of fresh citrus and does not leave a greasy feel. To effectively use Hawaiian Seaweed Moisture Creme to firm skin, warm a small amount between your fingertips to release its key ingredients. Smooth over face and neck.